Earlier this month, Taylor Research Group (TRG) associate Scott Connuck attended the Environmental Law Institute’s (ELI) Summer School seminar titled “NEPA, ESA and Fundamentals of Environmental Law" in Washington, D.C. 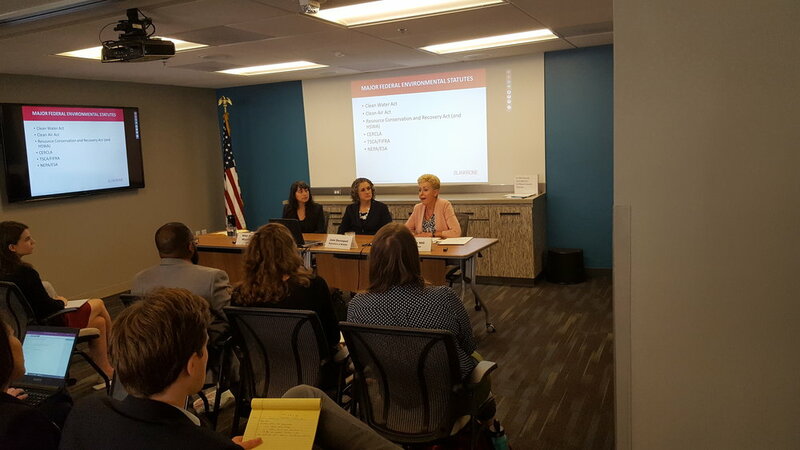 The event, led by three distinguished environmental lawyers, provided a detailed overview of the purposes, procedures, language, and controversies concerning the United States’ most significant environmental statutes. For example, the National Environmental Policy Act (NEPA) is known as the “Magna Carta” of environmental law, and the speakers discussed proposed changes to it under the Trump Administration. Panelists at the ELI Summer School Seminar "NEPA, ESA and Fundamentals of Environmental Law"
As part of this discussion, Margaret “Peg” Hill, a Chair of Blank Rome LLP’s Energy, Environment, and Mass Torts Practice Group, shared her experience working with highly contaminated areas known as Superfund sites. These are typically abandoned or former industrial sites that are heavily contaminated with harmful substances such as lead, asbestos, mercury, and/or polychlorinated biphenyls (PCBs) that must be treated and disposed of. The cleanup and rehabilitation of such sites is a costly endeavor that requires a highly coordinated effort among communities and responsible parties that is overseen by the Environmental Protection Agency. Ms. Hill provided an overview of the regulations and judicial precedents governing how Superfund liability is, and is not, assigned. Her insights were of particular interest to us because we’ve conducted research on several Superfund sites throughout the United States. Determining to what extent a responsible party is liable for the contamination found at a Superfund site is a key piece of any cleanup effort, and oftentimes one that is litigated for years. Our job as historical researchers is to help clients that have been identified as a responsible party understand their presence at a Superfund site over time -- from the operations and activities performed, to the quantities of chemicals produced, to any specific environmentally hazardous incidents that occurred there. Such information lends to a more informed assessment of a responsible party’s liability.